SAN BERNARDINO, Calif., Feb. 25 (SEND2PRESS NEWSWIRE) — Through government and business partnerships in San Bernardino County, training programs are helping reduce the number of people on welfare, develop their skills and stimulate businesses growth in spite of a tough economy. The County of San Bernardino Board of Supervisors knows that assisting businesses during these tough times is the key to our local economic recovery and uses funding received through the Workforce Investment Act to provide this assistance. J & R Fleet Services is a family-owned truck repair center based in Bloomington. The business had experienced steady growth since opening in 1998, but the economic slowdown of the last few years made it difficult to hire additional employees, especially trained workers. Six employees were hired last month into entry-level positions with J & R Fleet Services through Federal Workforce Investment Act (WIA) dollars administered locally by the Workforce Investment Board of San Bernardino County. These federal dollars reimburse employers for the wages paid during a pre-determined training period. In this case, all six employees had been receiving government assistance prior to being hired. To qualify for this program, participants must have been receiving government assistance. On-the-Job Training offers a way off the government’s payroll and a chance to develop marketable job skills that make participants a competitive member of the workforce. This program allows employers to grow in a difficult economy by obtaining temporary training subsidies. In these ways, federal funding is working successfully to create more job opportunities for our local workforce. For more information, employers and job seekers can inquire through the County’s Employment Resource Centers at (800) 451-JOBS. 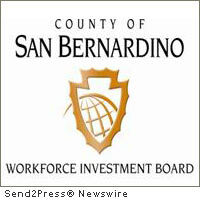 The Workforce Investment Board of San Bernardino County is comprised of private business representatives and public partners appointed by the County Board of Supervisors. The Board strives to strengthen the skills of the county’s workforce through partnerships with business, education and community-based organizations. The County Board of Supervisors is committed to providing county resources which generate jobs and investment. The Workforce Investment Board, through the County’s Economic Development Agency and Workforce Development Department, operates the County’s Employment Resource Centers (ERCs) and Business Resource Centers (BRCs). The ERCs provide individuals with job training, placement and the tools to strengthen their skills to achieve a higher quality of life, and the BRCs support and provide services to the county’s businesses including employee recruitment. Original Keywords: J and R Fleet Services, Workforce Investment Board of San Bernardino County, Economic Development Agency and Workforce Development Department, County of San Bernardino Board of Supervisors, Javier Rodriguez, California employment news Workforce Investment Board of San Bernardino County San Bernardino California SAN BERNARDINO, Calif.
REFERENCES: Business News, J and R Fleet Services, Workforce Investment Board of San Bernardino County, Economic Development Agency and Workforce Development Department, County of San Bernardino Board of Supervisors, Javier Rodriguez, California employment news Workforce Investment Board of San Bernardino County San Bernardino California SAN BERNARDINO, Calif.